Newstag adds CNN to its video news service. Stockholm, June 2016: CNN International will be syndicating its news, business, feature and entertainment content to Newstag, an award-winning 'mobile-first' video news service. The agreement grants Stockholm-based Newstag the right to share and distribute two hours of CNN video content per day on its mobile and online platforms alongside current affairs and entertainment content from other professional content producers around the world, including AP, AFP and Reuters. With 41 editorial offices and more than 1,100 affiliates worldwide through CNN Newsource, CNN provides local news organisations with products and services across all platforms. CNN Newsource is the industry's most powerful newsgathering resource. This announcement follows the news that CCTV - China's leading news agency - will also be joining Newstag, bringing quality news videos from four continents together through the innovative platform. By presenting these stories from different global perspectives, the platform sheds new light on international news as it breaks. Newstag Chair and co-founder, Camilla Dahlin-Andersson, says: "Newstag is delighted to be working with CNN, one of the world's most pioneering and innovative news providers. With the US presidential race in full flow, this partnership couldn't have come at a better time. We're committed to providing professionally produced global news coverage from truly distinct perspectives and CNN's output will contribute to creating a rich and nuanced understanding of the world we live in today." 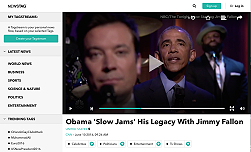 Newstag's 'mobile-first' service enables users to create their own 'tagstream' (or personalised TV channel) in seconds, organising, consuming and sharing stories among their social networks using the latest web and mobile technologies. These stories are available from a number of different perspectives, resulting in a platform that allows converging viewpoints to be presented side by side, shedding new light on international news as it breaks. Alongside breaking news, Newstag also offers users access to archive footage and documentaries covering everything from business, science and politics to arts, culture and sports. Specialist content providers include IMG Media, the world's largest independent distributor of sports programming and Videofashion, the video magazine covering all aspects of fashion. As the platform gears up for launch, Newstag is a start-up of the year finalist in the MEG-awards and was recently selected as one the companies best positioned for growth in Asia at Asia Beat 2016. Last year Newstag received a bronze award for 'Best News Website' at the 2015 Asian Digital Media Awards jointly presented by WAN-IFRA and Google. The platform was also selected as a top international start-up by Mobile World Capital Barcelona in a contest to recognise the most innovative use of mobile technology in business and won 'Best Start-up' at the 2015 TVB Europe Awards.